One more thing…while I’ve never run a marathon, and though I’m only at the 2/3rds mark of this trail, I do feel like I’m hitting “the wall”; physically, mentally, spiritually. Most of my creative ideas surrounding the hike and turning it into an “awareness” campaign were all formed before I even set foot on the trail. Now that I’m out here, I’m realizing how hard it is to sustain creativity and enthusiasm while constantly battling fatigue and exhaustion! All that to say, I’m still very thankful for this opportunity, the support of friends and family, and for the safety I’ve experienced thus far on the trail. The cause and the goals are still the same, but it’s only going to get harder. Thanks for hanging with me for this long. I wouldn’t have made it here without you. While I may not be the “poster child” for hiking the AT, I’m wondering if anyone is at least interested in hiking the AT as a result of reading my blog. I promise, it is a good time, I just tend to the melancholy for some reason. Plenty of hikers out here seem to never have a bad day. Is there something else you want to know about the trail, hiking, thoughts while hiking, etc? Discuss amongst yourselves and comment away. I’m here for you! I’d give you a fresh trail report, but as the video says…I’m not sure where my journal and trail book are at the moment (as of Sunday morning). Hopefully I’ll find it sometime this afternoon where I stayed, at which point I will be away from my computer until the next trail town. I hope I haven’t lost it for good! MOBILE UPDATE: (Sunday night) The books have been found! PTL! I left them in the Innkeeper’s shuttle van on Thursday. Silly me! Now I can enter the woods with confidence tomorrow knowing where I’m going. Sort of. Mostly. Unfortunately, I’m too tired to do the trail report by phone so y’all will have to wait on that one. My exact mileage is 1373.9 (+8 for approach trail way back when). Who wants to come hike with me??? haha…keep at it. You’re so close. Finish it! I am glad you took a day off for R and R but walking NYC is not what I would consider a break! I am praying for you. If the job is good, you can always return to where you left off to finish the trail. If the trail is good, God will open the door or keep this one revolving. Either way, I am soooooo blessed to call you my nephew. Just wanted you to know that I am thinking about, praying, and am SO PROUD of you!! I can’t imagine the mental, physical, emotional, and spiritual strain you must be under, but I will tell you that if there is anyone I know who can persevere, it is you. I was at Banker’s School in Illinois and met “Papa Smurf” (Trail Name? )and he told me to tell you that he has faith in what you are doing and wishes you well. It’s amazing the amount of people you have been able to touch during your journey. Keep up the faith and wherever God leads you, know people care about what you have been doing. Just wanted to say I’ve been following along since…TN and I’m encouraged by your perseverance. Keep up the good work. And congrats on the job offer. Tell us more about it. And no worries I still love to hike. Although doing the whole trail was never a goal of mine. So you didn’t crush any dreams. Its tough stuff but you can finish. and if you don’t right now…then you don’t…not the end of the world or the journey as I see it. I think what you’re doing is creative and inspired. God’s working through it in ways that you can’t tangibly see. What’s been your favorite town so far? I’ve been to Harper’s Ferry and loved it. So how cool was times square? perseverance producing character and character, hope. 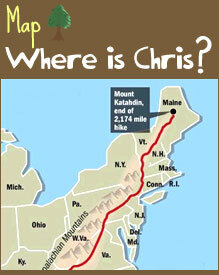 dear chris, i do forgive u for bypassing blairstown, nj and mohican rd. AT rest stop, steak, beer, bed and shower at our house. i was watching to see where your friend was taking u for beards longer than yours. certainly, williamsburg, brooklyn would do it-the labavisher jews inhabit with their hats, long curls and beards(or maybe it’s just the curls that are long). would love to hear about your job too, and i’ll continue to pray for you to know God’s will about your finish. Never have a bad day-don’t believe those dudes!!!! maybe they’re on the high side of bipolar and a little medicine will help them tell the truth. it’s got to be brutal SOME days. just be faithful in your devotion and trust in the Lord and keep being thankful for every day and everyWV CHILD SPONSORED! You’re doing awesome – keep going! Maine is phenomenal in late summer. I hope you get a chance to see it. About this job … a real, grown up job?! I’m so curious to know more. In the meantime, love and prayers for ya. Can’t wait to grab some coffee and talk when you’re done. Oh, I.L.I.!! Oh Christopher…you look pretty much the same as you did the first time i met you. I don’t know why everybody’s talking about “that beard”…I think you look like yourself with it on. Or grown. Whatever. I know you talk a lot about being spurred on by others’ encouragement, but let me tell you friend…you are quite the encourager yourself. Hearing your perspective as you’re on the trail reminds me that we as the followers of Jesus are all on the same journey. It may look different at different times, but we all have similar struggles, we have each other, and most importantly, we all have the same GOAL in mind. Stay strong, brother. Keep your heart wide open and God will show you incredible things! Thinking and praying for you often. And also…let’s play beautiful music together when you’re done! i’d be interested in hiking the Trail. tougher with a wife who’s not a big fan of camping, but it’s all good. one thing i’ve come to notice about myself is that whenever i see a “mountain”, i always want to climb it. whether or not the climbing actually happens is a whole ‘nother story. I just sponsored a child. One more down. We don’t know eachother but I just heard about your mission and I am amazed at what you’re doing. I think it’s awesome that you’ve inspired people to sponsor children in need. It’s sounds like you may not realize it but that you’ve learned a lot on your journey. I work at a school in a low SES area and your statements about struggling to focus on your goal due to exhaustion, hunger, etc. remind me of several of the kids I work with on a daily basis. These kids struggle to do well in school because they are tired, hungry, etc. I’m sure it’s difficult, but keep going. It’s for a good cause and there are already 5 children who are being taken care of because of what you’re doing. I’m on a mission to help people become aware of your cause to help increase that number. Keep us posted on your hike! Great to see a little video! Remember when we hopped into Manhattan after seeing Tom in Jersey? Good times. Hang in there friend!